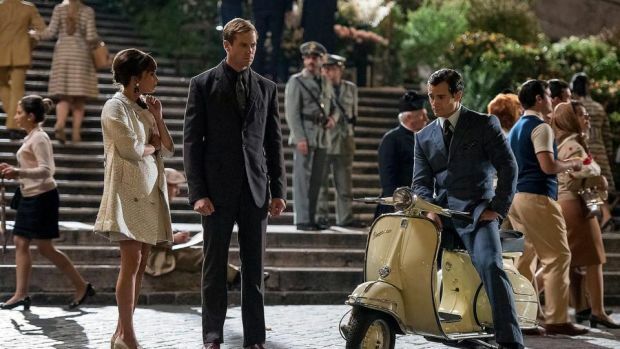 Gaby Teller (Alicia Vikander), Illya Kuryakin (Armie Teller), and Napoleon Solo (Henry Cavill, from left to right) ponder how to stop the evil Vinciguerras. Pop culture has always been captivated by the Cold War. Back in the day, its backdrop spawned the longest-tenured blockbuster movie franchise ever, the James Bond series. This fascination with spies from the East-West conflict has never ceased, particularly so with Hollywood reenacting television shows and feature films from that era. The latest example is The Man From U.N.C.L.E., once co-creator for the small screen by 007 inventor Ian Fleming and interestingly as well as daringly pitting a U.S. and a Soviet agent on the same side to fight against a multinational terror syndicate. Can director Guy Ritchie’s modern cinematic take on the beloved series bring U.N.C.L.E. back to life? In 1963, ex-con-turned-CIA-agent Napoleon Solo (Henry Cavill) frees and extract mechanic Gaby Teller (Alicia Vikander), the daughter of a former high-profile Nazi scientist (Christian Berkel), from East Berlin before she can fall into the hands of the hot-tempered KGB operative Illya Kuryakin (Armie Hammer). Upon reporting to his superior Saunders (Jared Harris), Solo learns that Teller’s uncle Rudi (Sylvester Groth) is employed by the wealthy Italian Nazi sympathizer Alexander Vinciguerra (Luca Calvani) and his femme fatale wife Victoria (Elizabeth Debicki), who plan to build their own private nuclear missile with the help of Gaby’s father. From that point on, the CIA man is forced to collaborate with his KGB counterpart and the mechanic to stop the evil couple from destroying the world. In Rome, Teller and Kuryakin pose as an engaged couple in front of the Vinciguerras and Rudi, while Solo assumes the role of an antiquities dealer, so as to find out how close to completing their weapon the villains have come and in which capacity her uncle, and perhaps also her long-lost father, is involved with the miscreants. When the MI6 agent Alexander Waverly (Hugh Grant) appears, another player enters the dangerous game of life played by the Vinciguerras – but whose side is he really on? A cult television show from a popular era, a number of contemporary movie stars, with a director who has made a career out of (cinematically) living amongst detectives, spies, and lowlifes. Sounds like a winning formula, right? You would think so. Guy Ritchie’s reading of The Man From U.N.C.L.E., however, falls short of such lofty expectations. For starters, it can’t decide whether it wants to be a full-blown persiflage or a serious spy thriller. During its running time of almost two hours, the movie constantly oscillates between these two poles. Whereas the filmmaker effectively introduced comic relief into his reinvigoration of Sherlock Holmes, he doesn’t succeed in this instance at all. Make no mistake, The Man From U.N.C.L.E. looks and sounds gorgeous. The costumes, props, and backdrops are all convincing, and Guy Ritchie’s distinctive audiovisual style shines through as well. Yet the humor falls flat and the picture simply isn’t exciting enough to compete with the more serious recent spy thrillers such as Daniel Craig’s version of James Bond in Skyfall and Spectre or the Bourne franchise spearheaded by Matt Damon and Jeremy Renner. It doesn’t help either that Armie Hammer’s Kuryakin is merely a stock-character Soviet agent from the old days, complete with a faux Russian accent in the same embarrassing category as that of the fake Nazis in the old Indiana Jones films. The same goes for Alicia Vikander playing a German and trying to speak that language. As amazing an actress as she may be, especially in her recent parts in Ex Machina and The Danish Girl – her use of that tongue is unconvincing. Add an unbalanced screenplay, courtesy of Lionel Wigram and the director, as well as anemic performances by both male leads, particularly by Hammer, and you have all the makings of a clunker. It doesn’t get that bad, for The Man From U.N.C.L.E. excels in terms of atmosphere thanks to Daniel Pemberton’s palatable jazzy score and John Mathieson’s excellent cinematography, but the film is a mixed bag overall that sometimes seems to drag on endlessly. If you enjoy the setting and the convincing audiovisuals, you might also enjoy Guy Ritchie’s retelling of the peculiar collaboration between Brits, Americans, and Russians. The disappointing conclusion is that The Man From U.N.C.L.E. feels like a wasted opportunity, because it could’ve been so much more, especially with ‘Superman’ Henry Cavill and Alicia Vikander on board, as well as Hugh Grant acting out his prototypical part as an English gentleman. It might just have grossed enough to mark the beginning of a new series, but it remains to be seen whether such a continuation would lead to better things or simply mean more of the same indecisive see-saw with what, on paper, looks like an awesome cast.